A. Layer 3 switches do not maintain a routing table. B. Layer 3 switches usually forward traffic faster than routers. C. Layer 3 switches support more interface types than routers. D. Layer 3 switches usually support fewer features than routers. Q2. What type of special memory is used by Layer 3 switches, and not routers, that supports very rapid route lookups? Q3. What type of interface can be created on a Layer 3 switch to support routing between VLANs on that switch? Q4. What is the default priority for an HSRP interface? Q5. 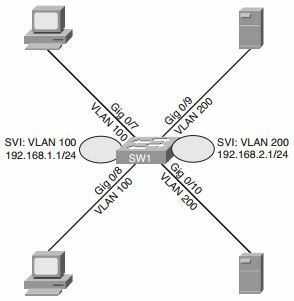 What is the name for the router in a VRRP virtual router group that is actively forwarding traffic on behalf of the virtual router group? Q6. Which of the following statements is true concerning GLBP? A. GLBP is a Cisco proprietary first-hop redundancy protocol. B. GLBP allows multiple routers to simultaneously forward traffic for the group of GLBP routers. C. The active virtual forwarder in a GLBP group is responsible for responding to ARP requests with different MAC addresses. D. A GLBP group has multiple active virtual gateways. Q7. Which of the following is a Cisco proprietary first-hop router redundancy protocol? A. OSPF sends a multicast routing update. B. An administrator Telnets to a switch. C. An ACL is applied to a switch port. D. A switch’s TCAM has reached capacity. CPU utilization for five seconds: 10%/7%; one minute: 12%; five minutes: 6% Based on the output, what percent of the switch’s CPU is being consumed with interrupts?